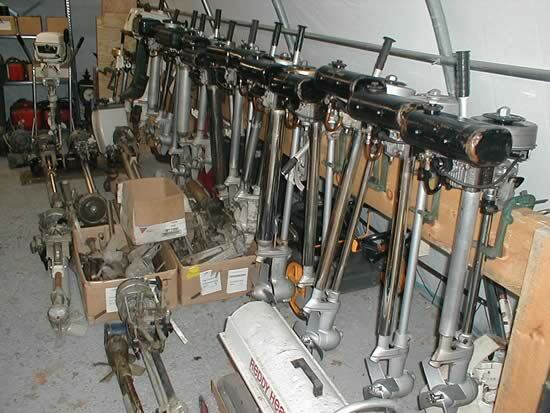 Here are some single outboards and collections from around the world. If you're a Seagull owner and would like to have your outboard posted here, email me some photos and details (info@britishseagullparts.com). Here is a nice collection from a Seagull enthusiast in New England. He tells me he'll be selling off quite a few of his outboards in the near future. Check back for more details! Thanks to Charles Palfreeman for providing the above photo. This photo is important in that it demonstrates the change in tiller mounting on the 40 Series outboards. His outboard on the left, a 40 Minus (SJM), has the standard side mounted tilting tiller. 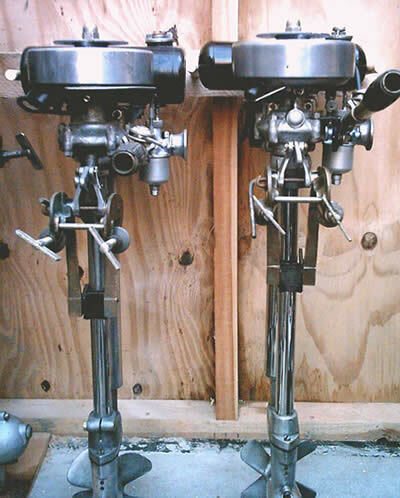 The outboard on the right, a Little Model 40 (FV - view more photos of his outboard), also has the tiller mounted on the side but notice it also has a spot on the crank case for a fixed, center mounted tiller. This particular model was a transitional model. It has a 'T' in the serial number which Charles points out meant it was equipped with a tilting tiller. In later models, such as the SJM, the 'T' was dropped as side mounting became standard. The 'T' also took on another meaning - learn more about letter definitions.